Making your own beard oil recipe isn’t rocket science, nor is it exactly the easiest thing to do. 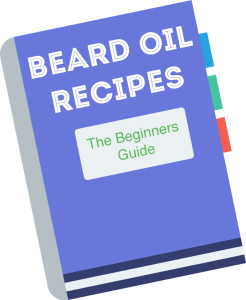 This insanely detailed guide will show you the EXACT steps that the beard oil manufacturers use to make and sell their own beard oil and more importantly – to make your own! 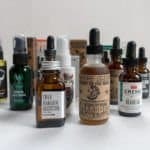 Editors note: Now if the whole DIY route isn’t your thing (and that’s completely fair), then you might want to check out our detailed post on the best beard oils that we reviewed. Of course if you don’t have the time to whip up your own batch of beard oil, you can just simply order an award winning beard oil. In fact, if you are feeling ambitious you could actually turn this hobby into a part time gig yourself! You see there are a lot of awesome beard oil manufacturers out there. I am lucky enough to count a few of them as really good friends – they are definitely great people and know how to run a business. 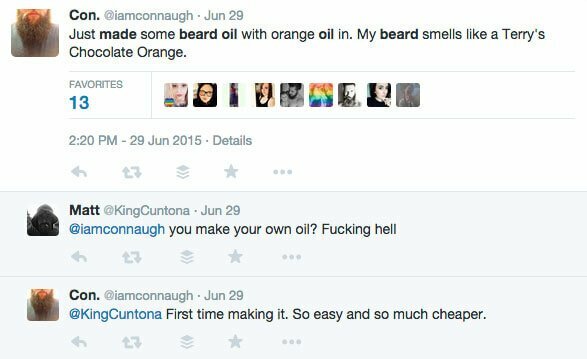 However with that being said, beard oil isn’t exactly the cheapest thing in the world. With everything in life its a whole lot cheaper to create something yourself than to buy it off the shelf (i.e. buying beer vs brewing your own, eating out vs eating in, driving a 10 hr car ride vs taking a 2 hr flight, etc.). But does beard oil follow suit? 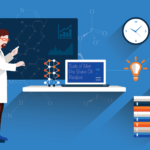 I’ll touch on that in just a minute – with charts and graphs for comparison too! First off, if your interested in making beard oil, clearly you have discovered the amazing benefits that it brings. If not, I invite you to bounce over and check out the primer I put together on the benefits of beard oil. 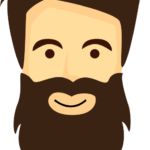 So let’s hop to it and deep dive into the ultimate and definitive guide to making your very own beard oil recipe! Quickly transform grooming routine today. Learn the ins and outs to not only look your very best, but also feel confident in yourself. Money doesn’t grow on trees. Yet your beard needs to be maintained. 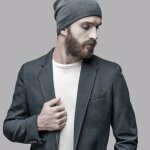 So how can you maintain a killer beard while saving a substantial amount of money in the long run? Well creating your own of course! Sure I know you are thinking to yourself, ok – it’s only $13.97, why the heck do I care? Your right, that doesn’t seem too bad after all. However lets toss some premium brands into the fray as well. 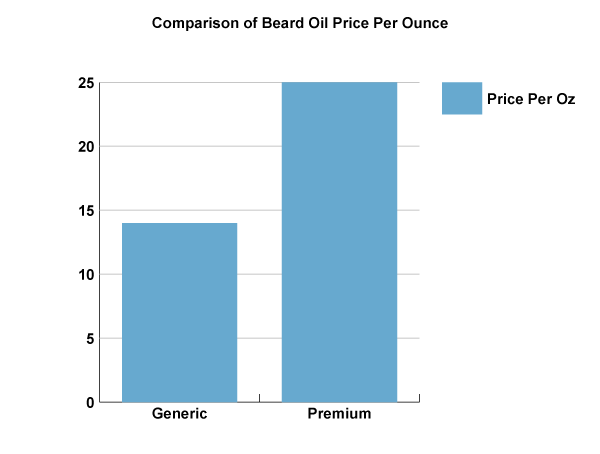 Roughly the average price for beard oil from a premium vendor is about $25. To note there were some beard oils listed above and below this range (as much as $50 and as little as $15 – excluding shipping). So for calculations sake, we are going to go off the average of a 6 month beard – about 8 drops. 1oz of beard oil should net you 600 drops. If you are applying beard oil every day (which you should), that 1oz bottle of beard oil will last you 2.5 months (75 days). Ok, ok, not too bad right? If we annualize that, we will be looking to spend roughly $70 a year in beard oil for the generic version and $125 for the premium version ($14/oz vs $25/oz respectively). Of course we haven’t talked about the disadvantages of not knowing the scent until it shows up to your door as well as tailoring one specifically towards your tastes – but I digress. Taking the same approach that we did above, I’m going to hop over to Amazon and look up a carrier oil (here is the one outlined below). $13.97!?! Wait a second, I thought saving money. That’s the same price for already pre-packaged generic beard oil! That’s $14 bucks for 4oz! Which equates to roughly 2,400 drops of oil – 4x the amount that we would have gotten if we just went with the generic one mentioned above. This one bottle alone will last you 10 months (about 300 days). Compared to the 2.5 months for the beard oil above. To make sense of it all, I went ahead and put it into a easy to read graph. 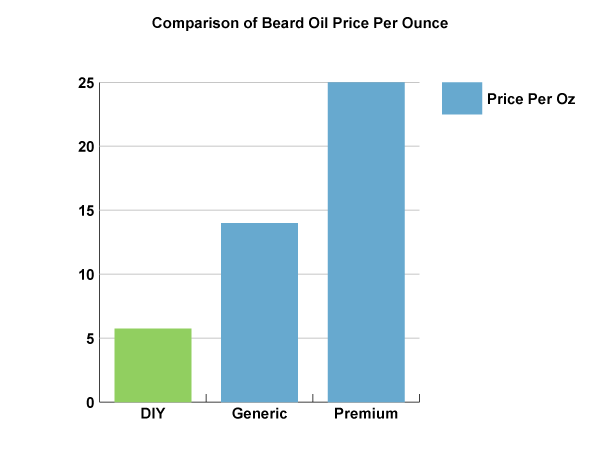 Here I am comparing the price per oz of beard oil – DIY vs. Generic vs. Premium. I know your asking yourself, wait did he include the cost of essential oils and own beard oil bottles? In fact I gave us an additional cushion of $10 extra bucks to spend on essential oils and bottles of which should be plenty! I don’t know about you, but I’m convinced. 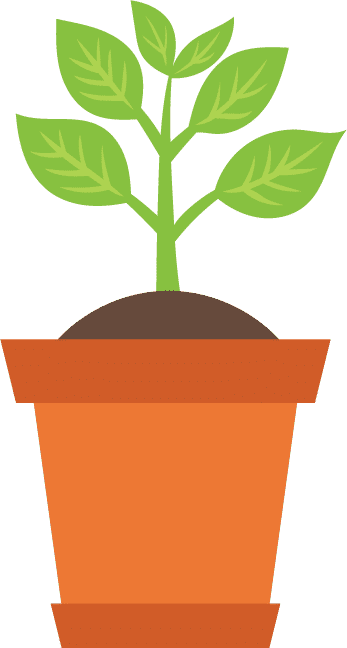 So not only on is there a real cost advantage – but the creative freedom that you will have when making it is quite honestly unlimited. You see I personally love a woodsy smell, but on the other hand, I don’t want to smell like Sasquatch. When you make your own beard oil, you have the ability to mix in just the right amount of scents so the odor isn’t too terribly powerful. Unlike purchasing any beard oil online, you will have ultimate flexibility and can round out the scent exactly to what you prefer. 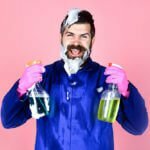 Before we deep dive into the scents that the essential oils give out, lets breakdown what a carrier oil is and why it is so important to your beard oil recipe. When making your own beard oil, you have two primary components to it. Carrier oils and essential oils. I’ll go over essential oils in a minute, but first lets check out what’s up with carrier oils. Carrier oils are going to make up the majority of the beard oil. By majority, I mean a super majority – 98 – 99% of the final product. Ok, this can be a bit daunting at first. What carrier oils do you want to use for your beard oil. I mean these are a TON to choose from. Well its actually quite simple. Since this is your first time crafting your own recipe I strongly suggest giving Jojoba (Ho-ho-ba) oil a shot. You see Jojoba is the closest to your natural skin oil that you can get. Even if you have naturally a bit more oily skin, Jojoba should not give you more acne or have any adverse effects. So don’t fret at all. There are a ton of great sites out there that breakdown the different oils and their uses. Your skin is of course specific to you. So only you are going to know what is best. Now when getting carrier oils there are actually a few things you do need to keep in mind. Don’t go to the grocery store to buy it. No seriously… set down the Crisco. You see the oil normally found in stores in not the same oil you would put in your beard. There are a few key differences here. What’s so special about cold pressed? Well if you were to use one that wasn’t cold pressed (e.g. expeller pressed) much of the derived nutrients from the oil were lost during the oil extraction process. Expeller press adds in the use of heat – therefore rendering the actual benefits of your beard oil little to none. Wait a second, I thought we were in the middle discussing the benefits of carrier oils, what does beer have to do with this? 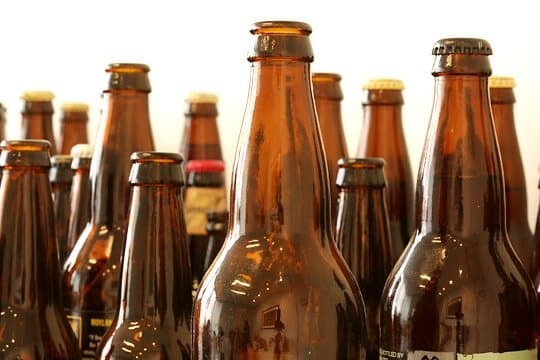 Ever wonder why most beer bottles amber in color? Its to block out UV lights and preserve the taste. So any beer worth its salt, should be packaged up in that way. Green and dark blue are also acceptable, but amber color is by far the best at blocking out harmful UV rays. 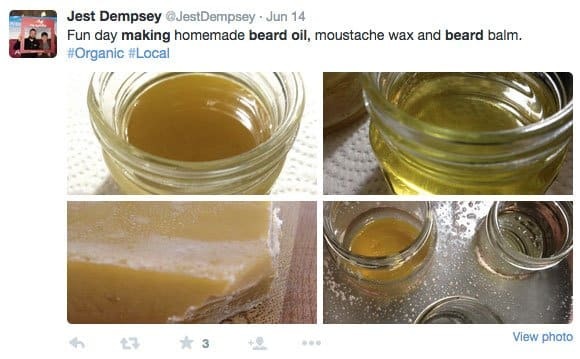 What does any of this have to do with your beard oil and carrier oils? Well honestly quite a lot! As we were just talking above, carrier oils provide a huge rush of nutrients to your beard. So its important to not only get one that’s cold pressed but also one that is in an amber bottle. Sure you could definitely take a gamble and get a clear one from your local vitamin shop or off of Amazon, but you would have no idea how long that bottle has been sitting on the shelf while its nutrients are being deteriorated from UV rays. So if you are going to plunk down some hard earned cash, personally I think its best to error on the side of caution and go with the amber bottle. This way you know your getting the maximum amount of nutrients. Your entire bottle (4oz bottle) of carrier oil should last a couple of years – assuming you apply it every day. After you make your beard oil and if you have left over carrier oil, you are definitely going to want to store it in a cool dry place. This way you can extend the maximum shelf life as long as possible. To further extend shelf life you can store the excess oil (i.e. backstock) within the fridge. Don’t worry if the oil solidifies as this is completely normal! Just take it out for a couple of hours and it will return back to its original state. 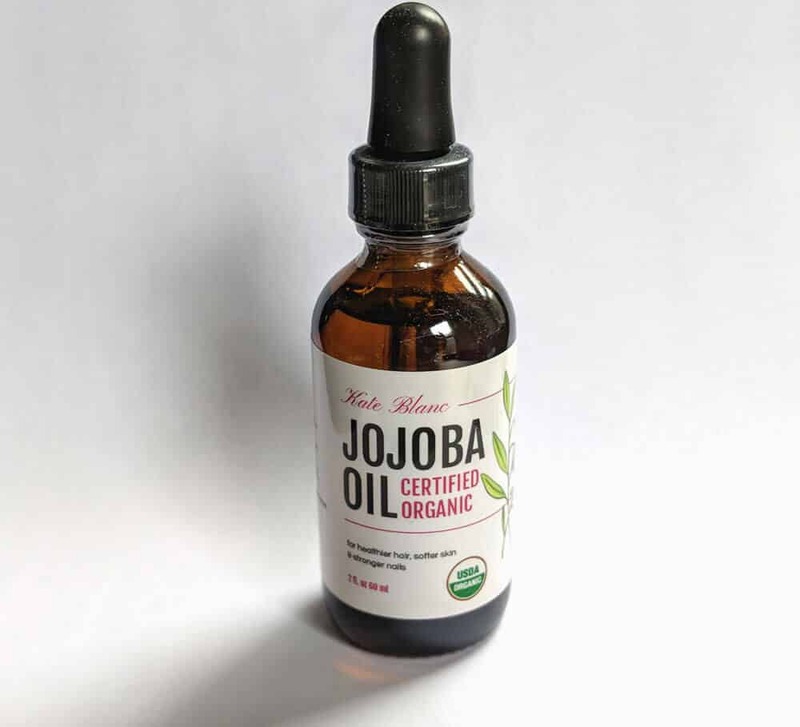 So its quite a bit to take in at first, so I would sincerely recommend sticking with a Jojoba oil before deep diving and exploring the other awesome carrier oils that are out there. Now that we got the baseline covered, what about essential oils? How do you make a beard oil recipe that smells good? Now technically you could go without it, but if your investing the time and effort to make your very own beard oil, you definitely need to go with a couple of essential oils to start. As we covered in the first section, even when adding a few essential oils to the order, you still will come out cheaper on a price per ounce comparison to generic and premium beard oil counterparts. You see essential oils are terrific in that they can give your beard not only an awesome smell, but can also add really great benefits to your skin as well. You will often come across essential oils that may give you benefits like increased blood flow. a beard oil that helps growth! You want your beard to look strong and healthy right? Well that’s one of the added beauties of essential oils. Ok – this is like drinking from a firehose I know. If this is your first time we have some great recipes listed below to get you started. However as a primer, if you want a beard oil that gives a bit more of a woodsy smell to it, you will want to stick around the cedarwood, pine, and sandalwood essential oils. If you are looking for more of a citrusy flair to your oil, grapefruit, lemon, and orange essential oils will be your friend. 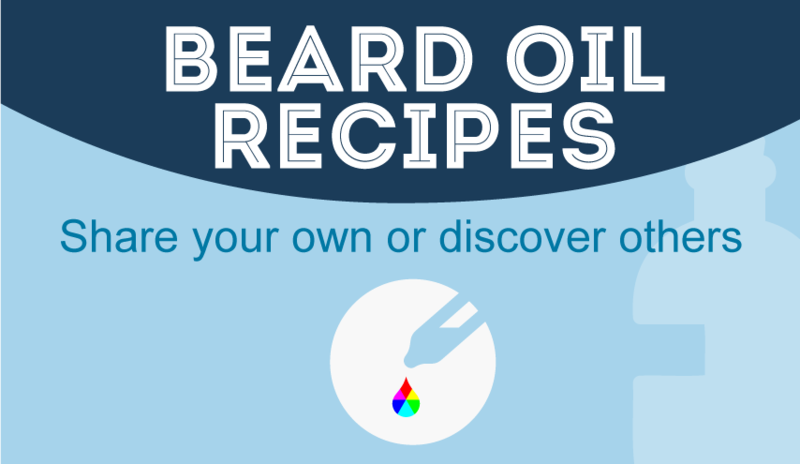 When it comes to making your own beard oil recipe, experimentation will be your best friend. Some guys have really sensitive skin. Most of them can use beard oil without a problem. However if you have sensitive skin and are making your own beard oil, the biggest reason you would experience any discomfort would be due to the essential oils. I highly recommend that you add essential oils very slowly into the recipe (1 drop at a time and see how your skin reacts). This way you can make the perfect recipe for you that won’t irritate your skin. Ok, so we went over the carrier oils and essential oils, now what? You have make sure that you have all the right tools for the job. Really this is pretty minimal. With a pack of 6 glasses you can try out a few different ratios of carrier oils and essential oils. There are larger packs on Amazon that are available but this being your first recipe, I think 6 should suffice. Basically that is it (in addition to the carrier and essential oils of course). The only additional item that you may want to get would be a pipette. These would ONLY be necessary if you pick up a carrier or essential oil that does NOT have a dropper already in the bottle (most of them do). You see if you don’t have a dropper and start using a communal one, the cross-contamination may breakdown the nutrients within the oils themselves thus partially rendering the benefits of your beard oil useless. So please do yourself a favor and make sure you don’t cross-contaminate! You are going to want to make sure you sterilize the amber bottles that you received. To sterilize them simply toss a pot of water on the oven, insert the bottles into the water and then bring to a boil. 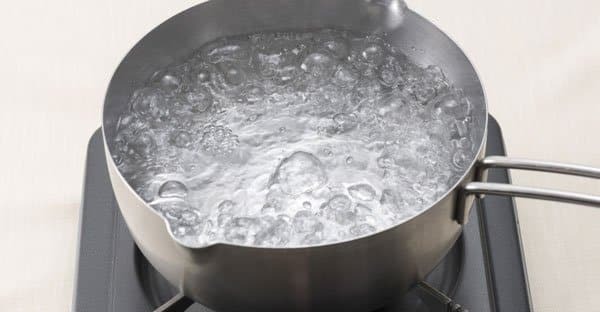 You do NOT want to toss cold bottles into a pot of boil water. If so, they may crack from the rapid temperature adjustment. Once boiling for a few minutes, use some tongs and take them out of the water gently. Be sure when you take them out that you pour out the water that is in the bottle so you don’t splash any on you. Once out, rest them on a few paper towels to let air dry. Once dried you are now ready to begin with the mixing process! To start off you are going to use your carrier oils first. As mentioned in the section above about carrier oils – these oils by themselves give you and your beard a TON of benefits. Technically you can just use a carrier oil by itself and call it a day. However, in the spirit of mixing and creating great scents and added benefits we will also be adding essential oils to our recipe. So to start you will want to add only 1oz as a base for your carrier oil into your sterilized oil bottles. This way you can create a few different oils and ratios to experiment with. After that is set, it’s time to move on to essential oils. As mentioned in the essential oils section above – I very VERY much recommend that you add essential oils slowly and carefully to your recipe. Especially if you have very sensitive skin. When mixing your oils together, you should write down the proportions that you use along the way. This way if you have any sort of flub up of a mixture that you don’t like, you will have a detailed description of everything that you did and won’t make that same mistake twice. This doesn’t have to be super complicated. Even just scribbling this down on a pad of paper is totally fine. The point is to just make sure you don’t get your ratios off two times in a row. As noted above, too high of a concentration of essential oils can result in skin irritation. Every guy reacts differently to essential oils, so make sure you don’t over do it. A good rule of thumb is to add one drop of essential oil and try out the mixture on one part of your beard (use only one drop of the mixture). This way you can gauge how your skin is reacting to the essential oils. Once you have the mixture rubbed into your skin, make sure that you give it about 5 minutes before moving on to a higher concentration of essential oil to carrier oil to the scent that you are aiming towards. Now I know you probably want to get your hands dirty right away! 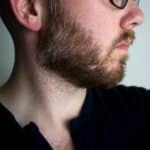 To help you with the process, here are a few starter recipes that have been submitted by Tools of Men readers through our beard oil database. This blend has a real mix of lingering fragrances. The Lemon-Lime Experience was a creation I came up with randomly as an experiment. I ended up trying it for a little while, and I ended up really liking it. It helps keep my beard from drying out, especially in these cold winter temperatures the Upper Mid-West gets often. It also does not smell too over the top, but you can still tell it is there. Cleansing Sage with warm sandalwood undertone. A concoction of essential oils and Grapeseed will leave you, or your loved one, begging for more. The aroma from the essential oils die down a little quicker than I’d like, but overall a good blend for someone experimenting. your own beard oil, not only do you save a substantial amount of money, but the creative freedom to make whatever you want with it is limitless.So I urge you to go out there and try making a few of your own. You will be surprised with what you come up with! 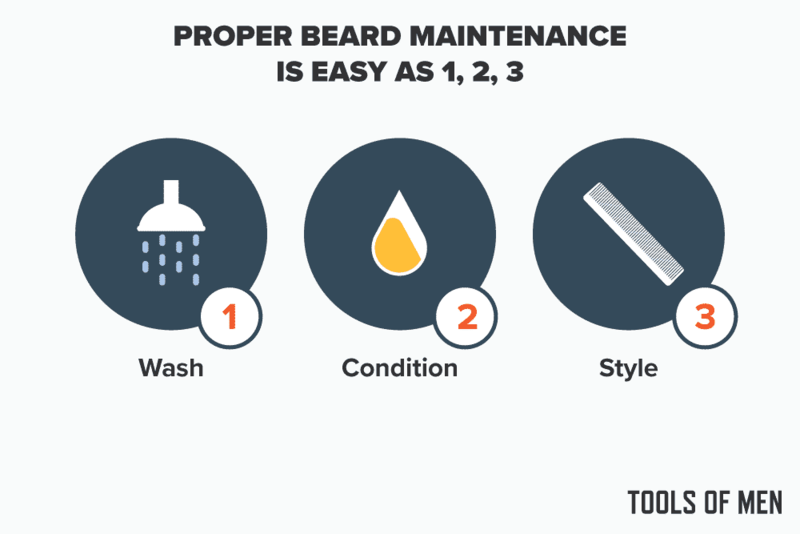 As great as beard oil may be in conditioning and moisturizing your beard, its only the 2nd step of the 3 required steps to a healthy and great looking beard (with the other two being washing and styling as pictured above). Now if you are wondering if those steps can be skipped…they can’t (sorry!). Sure you could use a standard bar of soap to wash your beard, but not only will it strip out all the natural oils but will also likely lead to beard dandruff. 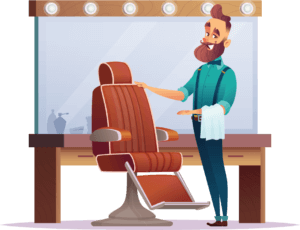 So be sure that you use a top rated beard wash or shampoo that has been designed to compliment your naturally coarser beard. 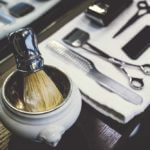 Whether you use one of the best beard combs on the market or simply go with a boars hair beard brush, these tools can be used to make your beard look on-point (I’m talking Instagram-worthy here).